The Maker’s Mark “Mark Of Great Art” exhibit opens in NYC tomorrow (10/22) @ the Astor Center (Gallery Room), 399 Lafayette Street (at East 4th Street) NYC 10003. “For over 50 years, Maker’s Mark has handcrafted their product, with every bottle considered a work of art. Now we are sponsoring a different project, one that gives Kentucky artists international prominence,” said Rob Samuels, Director of Global Brand Development for Maker’s Mark and concept developer of this new program. 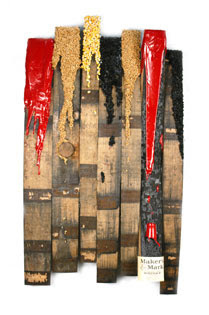 In March 2008, Maker’s Mark put out a call to Kentucky-based artists. Over 120 applications were narrowed down to 51 participating artists by a jury of experts. Each of these artists visited the historic Maker’s Mark distillery to gain inspiration for their piece(s). The total collection has now be broken up into eight mini-collections, with each going to a different city: Louisville, Lexington, Chicago, Seattle, San Francisco, New York, London and Madrid, where they will remain indefinitely. The pieces will be placed in bars and restaurants throughout these cities. MM will host a one-night event in each city where people can view the collection in one place (each city will receive about 15 pieces). Click here to view the dates, locations, and times of upcoming events.